Shishito peppers are delightful Asian peppers that are typically sweet, but one in every ten is spicy. These popular, small peppers are picked when green and can be grilled or pan-friend for an addictive treat. Our sustainably-grown, non-GMO shishito peppers have thin skins that blister quickly and are a perfect fit for summer menus. Baywater Farms non-GMO, shishito peppers can be purchased in 12-count clamshells and 10 lb. boxes. Our green, perfectly ripened shishito peppers are harvested after 60 days. Red, more mature shishito peppers are harvested after 80 days. Shishito peppers are a snack in and of themselves and can be prepared simply by roasting or blistering and seasoning with sea salt. They can be used in any traditional Asian dishes, stir fries, or skewered to grill. Part of the fun of shishito peppers is not knowing what you’ll get—something that’s sweet or something that’s spicy! 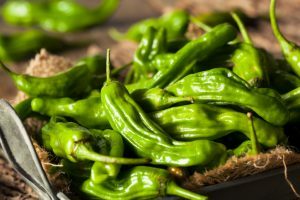 Shishito peppers are ripe for harvest when they are between 3-5 inches long and a bright lively green in shade. While we always pick at the peak of flavor, shishito peppers can also be harvested when they are more mature and bright red in color. Store picked shishito peppers like you would any other variety of pepper, like our albino bullnose, California wonder, purple beauty, or golden California heirloom peppers. Place unwashed, or washed and dried, shishito peppers in your refrigerator in a plastic bag. Moisture will make your shishito peppers spoil more quickly, so their longevity can be increased by storing them in a location without much moisture. Baywater Farms is passionate about cultivating non-GMO produce with love and care in the same soil that our great-grandparents tilled. On our sixth-generation family farm, all of our heirloom produce is grown using high-quality seeds that yield gorgeous, colorful, and delicious results. We use ecologically-friendly farming methods and are dedicated to preserving the provenance of our seeds, re-introducing historical crops, and supplying everyone in the area with locally grown produce with a conscience. You can find our fresh shishito peppers in national grocery store chains, produce distribution companies, roadside farm stands, local farm-to-table restaurants, CSAs, and farmers’ markets. To learn more about ordering our fresh local produce, click here . Our excellent sustainably grown, non-GMO produce speaks for itself, and we know your taste buds will love to listen!